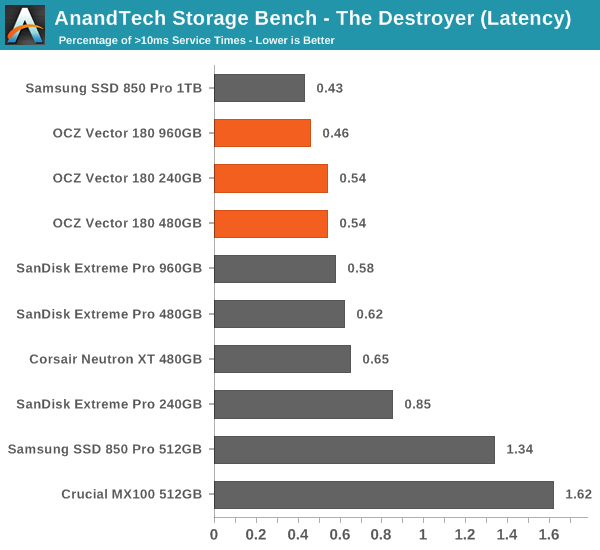 The Destroyer has been an essential part of our SSD test suite for nearly two years now. It was crafted to provide a benchmark for very IO intensive workloads, which is where you most often notice the difference between drives. 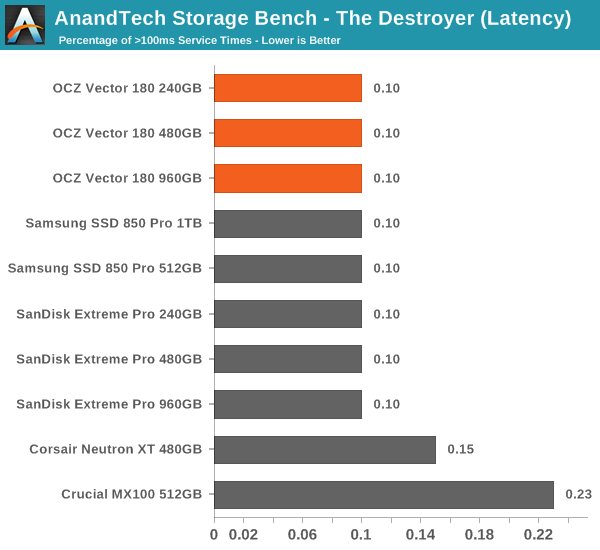 It's not necessarily the most relevant test to an average user, but for anyone with a heavier IO workload The Destroyer should do a good job at characterizing performance. The table above describes the workloads of The Destroyer in a bit more detail. Most of the workloads are run independently in the trace, but obviously there are various operations (such as backups) in the background. The name Destroyer comes from the sheer fact that the trace contains nearly 50 million IO operations. That's enough IO operations to effectively put the drive into steady-state and give an idea of the performance in worst case multitasking scenarios. About 67% of the IOs are sequential in nature with the rest ranging from pseudo-random to fully random. I've included a breakdown of the IOs in the table above, which accounts for 95.8% of total IOs in the trace. The leftover IO sizes are relatively rare in between sizes that don't have a significant (>1%) share on their own. Over a half of the transfers are large IOs with one fourth being 4KB in size. Despite the average queue depth of 5.5, a half of the IOs happen at queue depth of one and scenarios where the queue depths is higher than 10 are rather infrequent. The two key metrics I'm reporting haven't changed and I'll continue to report both data rate and latency because the two have slightly different focuses. Data rate measures the speed of the data transfer, so it emphasizes large IOs that simply account for a much larger share when looking at the total amount of data. Latency, on the other hand, ignores the IO size, so all IOs are given the same weight in the calculation. Both metrics are useful, although in terms of system responsiveness I think the latency is more critical. As a result, I'm also reporting two new stats that provide us a very good insight to high latency IOs by reporting the share of >10ms and >100ms IOs as a percentage of the total. I'm also reporting the total power consumed during the trace, which gives us good insight into the drive's power consumption under different workloads. It's better than average power consumption in the sense that it also takes performance into account because a faster completion time will result in less watt-hours consumed. Since the idle times of the trace have been truncated for faster playback, the number doesn't fully address the impact of idle power consumption, but nevertheless the metric is valuable when it comes active power consumption. For a high-end drive, the Vector 180 has average data rate in our heaviest 'The Destroyer' trace. At 480GB and 960GB it's able to keep up with the Extreme Pro, but the 240GB model doesn't bear that well when compared to the competition. The same story continues when looking at average latency, although I have to say that the differences between drives are quite marginal. What's notable is how consistent the Vector 180 is regardless of the capacity. Positively, the Vector 180 has very few high latency IOs and actually leads the pack when looking at all capacities. The Vector 180 also appears to be very power efficient under load and manages to beat every other SSD I've run through the test so far. Too bad there is no support for slumber power modes because the Barefoot 3 seems to excel otherwise when it comes to power. As this is my first post on this article please allow me to identify myself as an OCZ representative. Hi Zodiacsoulmate thank you for your comment. We do feel like PFM+ helps add more protection for power users and ultimately it was our goal with this drive to create a product that delivered both high performance and enhanced reliability by leveraging some of the features from our enterprise drives. Thank you for your business and we are sorry that you have had issues with any of our drives in the past and in regards to the very first Vector drives we have released a firmware update that addresses sudden power loss issues. If you currently are experiencing any issues please do not hesitate to contact our support team and we will be happy to support you. Glad to see you're watching. I've had two failed OCZ drives, one DOA and the replacement 8 months later. The packaged replacement (unopened) was sold on eBay out of fear, at which point OCZ was sworn off. I had two expensive (at the time) Vertex 2 drives. One bricked after about two weeks. The RMA drive bricked immediately when updating the firmware. I have the replacement drive but I don't trust it enough to use it. The other drive I bought worked through several firmware updates (a few months) but bricked after I put my second Macbook Pro to sleep. I was busy with graduate school and a job and didn't have a chance to update my backup and part of the next day's final presentation for a course and also some important poetry. I had been lulled into a false sense of security because the drive had operated with no trouble for several months. 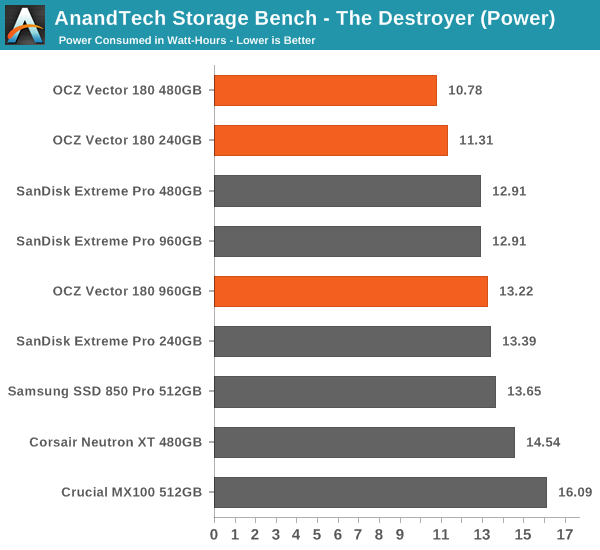 When Anandtech wrote about how OCZ started selling Vertex 2 drives with half the NAND chips in them, without changing the specs, it didn't say anything about reduced reliability. However, from my experience and from what I've seen from comments on the Net (such as Amazon reviews), the failure rate for these drives was extremely high. Also, when OCZ offered a replacement option for those burned by the bait and switch hidden 32-bit NAND (full chip complement) to 64-bit NAND (half the chips) transition -- it never offered it for the 240 GB model. 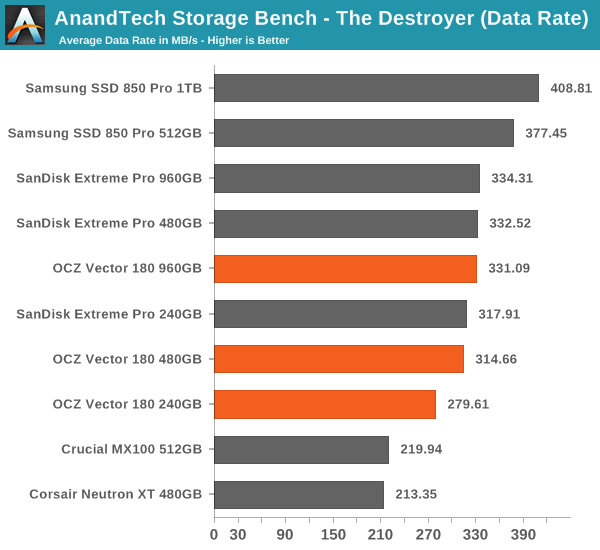 One of Anandtech's writers also said they didn't experience failures with their Vertex 2 drives but those were most likely all 32-bit NAND drives. OCZ never released a utility for dealing with bricked Sandforce drives due to their "panic mode" that would help users get some data recovered. Instead, their forum staff just said "RMA or send to DriveSavers". 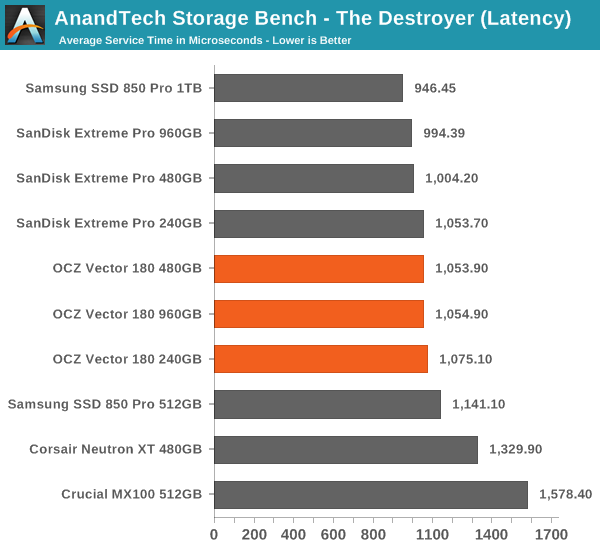 From what I gathered from my Google searches, the panic mode (which Anandtech's Vertex 2 reviews didn't mention as I recall) was designed to protect Sandforce's flaky firmware from reverse-engineering at the cost of making it extremely difficult (impossible for consumers without spending thousands for DriveSavers) to obtain their data. And, since these drives love to corrupt themselves at the drop of a hat (possibly due to deduplication of critical filesystem data), it's unlikely that most of the panicking is caused by serious problems with the drives like the actual failure of a NAND chip. "it's unlikely that most of the panicking is caused by serious problems with the drives like the actual failure of a NAND chip."